Totsuki Academy is the most prestigious cooking academy in the world, and for good reason: it houses many of the world’s finest potential chefs, and cultivates their individual talents. However, with so many great chefs, the competition inside the academy is substantial and Soma Yukihira has his work cut out for him if he wishes to reach the top. The Fall Classic is in full swing now, and all of the hopeful contestants have been split into blocks A and B for the preliminaries, with only four students from each block granted permission to participate in the finals. With so many potential victors, who could possibly emerge triumphant, and who will be ending their race to the top prematurely? Food Wars! 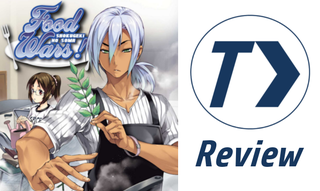 is a series that will appeal to an interesting mix of audiences: the shounen battle fans, and those with an interest in cooking, as the series combines both in its storytelling. Food Wars! has always been a series that whose appeal has been centrally on its execution. Different elements of the writing and art have been utilized and paired effectively in the past, resulting in a series that has exceeded expectations for me in the past. This volume takes that to a whole new level. Much like many of the dishes in the story this time around, in a way the appeal of this volume relative to its predecessors is difficult to put into words. As was set up by the previous tankobon, the Fall Classic is in full swing now, and for the first fourth of the story we get to see each of the contestants as they work on their dishes, followed by each individual presenting their food to the judges. Through this, a unique sense of suspense is granted to readers because unlike the previous volumes, the suspense is coming from several sides at once. It isn’t just a matter of who will qualify for the finals; we know all of these characters far more intimately than a series with such an ensemble cast could be expected to handle. Eight contestants will make the cut, but there are far more than eight contestants that prove to offer intrigue in both their dishes and their personalities. Even characters previously left mostly undeveloped or entirely new members of the cast have their moments to shine, both in their dishes themselves and their presentation of the dishes, which all reveal new facets of the presenters. I felt drawn in through the entire volume because of the rapid fire of these presentations, all of which felt complete and unique in and of themselves. Because of this, the ‘volume’ of the volume felt substantial and like a very worthy addition to the series. All of this development is aiding by the absolutely fantastic art, which is put on display to an even greater effect than usual as each unique character design feels interesting in its own right and makes it easy to differentiate between characters on sight. Artist Shun Saeki is usually quite impressive, but he has clearly outdone himself this volume with the amazing amount of detail put into the multitude of contestants. It’s not just the drawn art that is absolutely fantastic, however, as the food recipes are arguably the most uniquely diverse element the entire series has to offer, and much like other elements of the series it is even more substantiated in the seventh volume. Every single contestant’s dish has elaborate and real-life quality design to it, and each one is completely different from the others while matching the personality of the character that created it. The amount of thought that went into the dishes is of incredible benefit to Food Wars!, and helps make the seventh volume particularly memorable. I did not feel that there was anything particularly of note that could be attributed negatively to this volume for a series already in full swing. Perhaps to be nitpick-y, you might be upset that one of the fan favorite characters Erina Nakiri has very little page space, although the authors made that very clear from the beginning of the volume. Food Wars! volume seven is my favorite tankobon of the series thus far. It utilizes the Fall Classic by effectively managing a whole ensemble of characters, as each one’s unique take on the challenge is explored with a depth seemingly impossible for the under 200 pages within the volume. The illustrations and recipes are both thought-out and synergistic with the cast, and combine to make an excellent and thoroughly gripping arc of story. If you are a fan of the series already or have been wondering if it would get better before jumping in, I highly recommend giving this one a read, I most definitely was not disappointed. Food Wars! : Shokugeki No Soma Volume 7 will be published by Viz Media on August 11th, 2015. Authored by Yuto Tsukudo and drawn by Shun Saeki, the series adaption began in 2012 and is still ongoing in Shueisha’s ’s Weekly Shonen Jump magazine. Volume 8 will be published in English on October 6th, 2015, and an anime adaption produced by J.C. Staff is currently airing.